Sodium and potassium are minerals that work together to regulate the transport of nutrients into the body's cells and remove waste from the inside of a cell. Any imbalance between these two electrolytes leads to excess fluid entering the cells, which causes the tissues to swell. 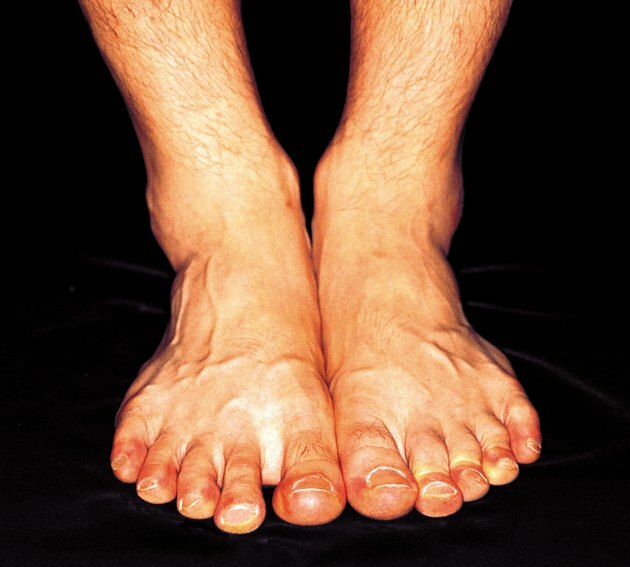 When fluid accumulates in the tissues of the lower extremities, swelling of the ankles and feet often occurs. Sodium is a mineral that acts as an electrolyte. It helps keep the amount of water inside and outside of the body's cells in balance. Too much sodium in the diet can raise blood pressure, increasing the risk of heart disease and stroke. If you have heart disease, consuming excessive amounts of sodium in your diet can lead to edema – or water retention – causing the legs, ankles and hands to swell. High sodium intake can also impair kidney function. Although it is uncommon to suffer from low sodium levels, severe vomiting and diarrhea or taking medications such as diuretics can cause sodium deficiency. The mineral potassium plays several key roles in the body. Cell function depends in large part on proper potassium levels. Potassium helps regulate heartbeat and aids in nerve conduction and muscle contraction. This essential nutrient also plays a part in assuring a correct fluid balance between body fluids within and outside of the cells. Doctors rely on lab tests to measure the potassium level in the body. Symptoms of potassium deficiency include muscle weakness, irregular heartbeat, headaches, chronic fatigue and swollen feet and ankles. In some cases, you may have to limit the amount of potassium you consume in your diet if you have kidney disease or are taking certain medications. Drinking too much water can cause sodium levels in the blood to drop. Impaired kidney function, nutrient deficiencies, hormonal problems and potassium loss due to the overuse of diuretic medications are some other causes of water retention. Although swelling caused by the buildup of too much fluid in the tissues can occur anywhere in the body, edema often affects the feet and ankles. The effect of gravity normally causes swelling in the lower extremities. When there is too much sodium in the body and the kidneys cannot excrete it, the body reacts by increasing fluid volume as a way to dilute the extra sodium. You can stop water retention by reducing sodium in your diet and increasing your intake of potassium. Either too much of a mineral or a deficiency can lead to electrolyte imbalances in the body. Sometimes, dietary changes can correct the condition. Your doctor might instruct you to eat more potassium-rich foods if you have low serum potassium levels. In the case of a low blood sodium level, you might need to restrict your water intake. At times, a severe electrolyte imbalance is due to an underlying health condition in need to treatment. Eventually, additional symptoms related to water retention and swollen ankles may develop. Symptoms can include weight gain, swollen hands and wrists, increased urination, high blood pressure and heart palpitations. The Podiatric Institute recommends self-help methods to help decrease swelling. These include limiting salt intake, drinking plenty of water, increasing physical activity by walking, using diuretics cautiously and talking to your doctor about using a compression pump to stimulate the movement of blood and fluid up the limb.